In response to a reader's request, I am showing in this post how to make a picture (an image, photo or screenshot) clickable, that is, become a hyperlink. The first thing is you must get the picture up on the web. This you can do by uploading to Photobucket, Get Blogger to host your picture or start a PUBLIC Google group to upload your photo. Get the URL of the photo on the web. To the ><img> tag, you can add more attributes separated by space, especially the alt="description" tag which will give some information of the picture and will server 2 purposes. Search engines cannot read images, but they can read what is written what is typed between the "" marks in the alt="" tag. This will help the search engines knows more about your post and helps in SEO (Search Engine Optimization). When for whatever reasons the picture cannot be displayed, instead of an empty box, the visitor will see what it typed between the "" marks in the alt="" tag. Another attribute is the width="W" where W is the width of the image in pixel you want it to display. This is especially important when the image you uploaded is a wide picture which may exceed the width of the main column (if you include it in a post) or the width of the sidebar (if you put the image in the sidebar). You will then have to know what it the width of the main column or siderbar. Refer to How to find the width of the blog Header, main column and sidebar (click BACK button to get back to this page). A less important attribute is the title="" attribute. If you add this attribute, when a visitor hovers the mouse over the picture, a tool tip will appear displaying what you typed between the "" marks. This may give more information to the visitor on what to expect if he clicks on the hyperlink picture. I have width: 395px; because the width of the main column of the main column (posts) of this blog is 400. height: 100px; I can change to suit what I put inside the scroll box. For example, I edited height: 100px; to height: 40px; for the scroll box above. If you want to find the width of your blog Header, main column, sidebar, refer to How to find the width of your blog Header, main column, sidebar (click BACK button to get back to this page). Regarding making a scroll box, you should refer to Make a scroll box (click BACK button to get back to this page). Once you have entered what you want, just press "Replace all" and it will all be done automatically for you. You can then highlight all the edited code and paste it into the scroll box. I hope this is clear. If you have further question, leave a comment. I have previously publish a post Another way of adding graphic to your blog Header (click BACK button to get back to this page), but the result wasn't satisfactory. I had no time to do further testing. Now I have. which tells me that the width of the Header is 750 pixels. I opened the free and very good Irfanview free photo editor and resized the width of the image and save the image again. I deleted the original too wide image from the Header, then uploaded the resized image again, and you can see the result at Good Hobby Ideas. You will notice the image fits the Header nicely. Some bloggers are not satisfied with the simple "comments" at the bottom of a post which you have to click to view or leave a comment. They want to change it to something else like "Leave Your Comment" for example. To see a blog where that has been changed, surf over to Google AdSense Signup Page. Look at the bottom of the only post. The standard "comment" have been changed to "Leave Your Comment". To help you find the code, click ctrl+F and type or copy-paste part or all of the code you are trying to find into the "Find" field at the taskbar at the bottom of the page, and click "Next". The code will be located and highlighted. Another way to do is is to click inside the template editor window, press ctrl+A to highlight all the codes, press ctrl+C or right-click and select "copy" to copy the expanded template into clipboard, open a Notepad file, paste the template into it. Click Edit > Select All in the menu bar at the top to highlight all the template. Click Edit > Find in the menu bar, and copy-paste part or all of the code you want to find. For example, paste <data:top.commentLabelPlural/> into the "Find what" box, and then click "Find Next". Replace <data:top.commentLabelPlural/> (highlighted in red) with "Leave Your Comment". Click inside the Notepad file and press ctrl+A to highlight all the edited template, click ctrl+C to copy into clipboard (or click EDIT > SELECT ALL in the menu bar followed by EDIT > COPY). Go back to the template editor. The whole of the original template should still be highlighted. 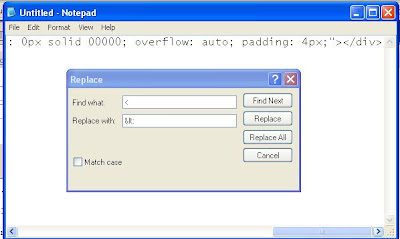 Click DELETE key to delete the original template, then press ctrl+A to paste the edited template in the clipboard into the template editor window (or right-click inside the template editor window and select "Paste"). Click PREVIEW at the bottom of the page and if satisfied, click "Save Template". If you want to check, click VIEW BLOG to confirm that the standard "comments" have been changed to "Leave Your Comment" (or anything else you had chosen). If you want the Haloscan commenting system for your Blogger blog, it used to be very difficult. See Testing Haloscan commenting system hack for Blogger Beta (now New Blogger. Things have changed since, and installing Haloscan commenting system for New Blogger is now a breeze with their installation wizard. All you need to do is to sign up for an account at http://haloscan.com/. They don't even need you to verify your email address. For tasks like this, I highly recommend using a browsing that has tabbed browsing like FireFox (click BACK button to get back to this page) which also happened to be recommended by Blogger. Then you can be in the Haloscan page in one tab, and in the Blogger page in another tab, all in the same window. I forgot to record the steps I took as I install the Haloscan system for New Blogger, but it is not difficult. After signing in, look for the Blogger installation wizard link. Click on it and it will take you to the wizard. It will instruct you to first sign into your Blogger account, click LAYOUT, click the TEMPLATE tab, then the EDIT HTML sub-tab. Backup your blog. See Backing and Changing New Blogger Template. BTW I used the filename "foodasmedicine 27 July 07 before Haloscan" as the filename so I know the reason for the backup. Click "Browse" and locate the backup template you saved as described above. After a successful upload, you will be taken to a page with a button "Download new template". Click on that button and you will be asked to download the new xml template file for your blog. Click "Save" and save the new template with a suitable name. To give you some idea, I used "foodasmedicine 27 July 07 after Haloscan". After a successful download and having saved the new template where you can locate it again, go back to the Blogger tab, click TEMPLATE tab, then the EDIT HTML tab and click "Browse" and browse to the new template you downloaded from Haloscan. Once you have located it, click UPLOAD and wait for the template to finish uploading. Once that is finished, your job is done. If you want check, click VIEW BLOG and make a test comment. Regarding the rest of the Haloscan commenting system, I will check when I have time and update this post accordingly. If you have been using the Haloscan all along, and you have some information for me, please post a comment. It will be highly appreciated. Update 28 July 2007: A reader alerted me to the fact that it IS possible to get the email address of commentator with the Blogger commenting system. See Get email address of commentator with the Blogger commenting system (click BACK button to get back to this page). Update 30 September 2007: I myself do not use Haloscan commenting system except for one blog which I used for demonstration. However, I did not check if the old comments had been deleted or not, so I cannot vouch for this. But a blogger commented if you implement Haloscan commenting system for your Blogger blog, all your old comments will be deleted. See comments section. Update 27 December 2007: I am going to revert back to the Blogger commenting system for Natural Remedies as I find moderating the comments inconvenient, and now prefer the Blogger commenting system as it has introduced Open ID. Fortunately, I have followed my own advice to back up the template PLUS Page Elements (and named the backup template ".....before Haloscan comment hack", so I know exactly which template to put back. Often, bloggers ask questions about how to do certain things which I believe can be done by making use of Label List in the New Blogger. I do multitasking and often try to do more than one thing at the same time. I think I was doing this post to answer a blogger question, and then left it to do something else. I have already made a post (recently which may address this issue. Refer to Link List: What it is and how to make use of it. The relevant section I think is at the bottom of that post. The section of your blog above the fold (what you visitor see without have to scroll down vertically) is the most important part of your blog. Businessmen like ground floor shop space, and that section above the fold is like ground floor shop space. Just as shoppers are lazy to walk up the stairs the second floor (the third floor would be worst), surfers are often lazy to scroll down your site to see the rest of the page and will quickly surf away if nothing catch their eye. So depending on what your objectives are, you should try to put what you want your visitors to see first above the fold. And the best way for you to do this is to use a 3 column template and not use a deep graphic Header that takes up most of the space above the fold. You may find it makes your blog attractive, but you will be unable to put many things above the fold. 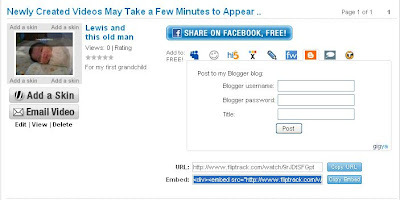 Add searchbox, graphic, AdSense ads unit or link unit, etc, to blog Header. I think 3 column is useful as it helps you put more stuff above the fold (what you visitor see without have to scroll down vertically) that is helpful. I suggest you start using labels and then add a Label List to the first left column. Helps your visitors find relevant new/old posts quickly (I put Labels (Categories)) when I add a Label List as other bloggers using different blogging platform are more familiar with the term categories. It is probably possible to get rid of one sidebar with some tinkering of the CSS and if you don't want to have an empty space in its place, you will have to change the main column and sidebar widths plus do some calculations. As I am a 3 column addict, I have no interest in trying and lots of other things to do. I hope you accept my suggestion above as I really think 3 column is very useful. Many surfers are lazy and if they don't see the thing they are looking for when they first land on your blog, they will quickly surf away without bothering to scroll down to see what else is there in the rest of the page below the fold. I have added the attribute target="new". Some also use target="_blank" but the first one you don't need to press the shift key and is shorter. Please note that both has been deprecated and is on the way out with the XHTML (strict) coming into force. However, both will still been supported by XHTML (transitional) for a long while more. as it tells nothing about the target site, and is useless for telling search engines what that target site is all about. Daniel Thomson posted a nice comment about my blog at Put photo of authors in post footer alerting me to a post Profile Directory: Blogger Tips and Tricks. He also have a post explaining the importance of a Profile page and why he set up that Profile Directory at Why Profile Pages are important. I have added my profile to his profile directory, and it may help you get more traffic to your blog if you do that too. and change the blog background according either color or image. If this option is not offered you will either have to stick the old method of changing background described below or change to a Template Designer template. Blog reader asked this question and I figure I might as well answer in a post. The last will give you a greater choice of color. 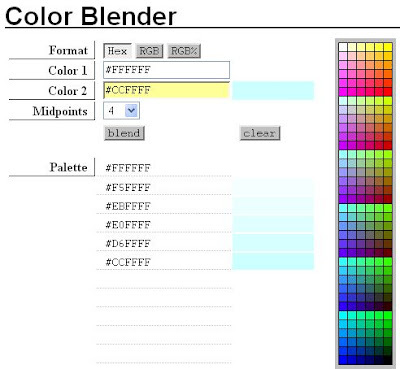 For the last example which use HTML color code, you can get much help using the free ColorPic tool. I used it frequently. You can Google for it by typing the search term "colorpic" or "color picker" into the search bar above (tick "Web"). Do exactly as above, but this time, upload the image to the web either using the free Photobucket or use Blogger to host the image as described in this post Use New Blogger to host your pictures for the profile photo, sidebar, blog Header, etc.. Get the photo URL. Please note that in the l is a L and not 1 (one) and the is a ! (exclamation mark). Important note: Before you make any changes to your template, always backup your current template PLUS Page Elements first. Refer to Backing up and changing New Blogger template. Wrapping text around AdSense ads by replacing <!-- with etc. As the main column width is 600 pixels wide, and AdSense has said that 336x280 Large Rectangle is one of the better performing format, I chose this format for the blog Fish and Fishing as the main column is wide enough to take this format in comfortably. Preview and if satisfied, click "Save template"
As usual, preview, and if satisfied, click "Save template". Note: AdSense only allow 3 AdSense for Content units per page. So if you incorporate the unit into the post, theoretically, you will have one AdSense units in each post. So if you have the default 7 posts for the main page, you will have 7 AdSense units in each posts plus any other Ad units in the sidebar/s and/or footer and/or Header. AdSense suppresses any excess units so that only the first 3 units (which 3 depends on your template) are displayed. For most of my blogs, only the first 3 units in the first 3 posts will get displayed and if I have skyscraper unit in my sidebar and leaderboard unit in the footer, these plus the ad units in the rest of the posts will be suppressed. It is only when you are in an individual post page (permalink) where there is only one post that the skyscraper unit in the sidebar and the leaderboard unit in the footer plus that one unit in the post get displayed. I have tried this once for one blog and asked AdSense Support if it is OK and their response was that it is OK for THAT blog. They left the question about applying the same thing to other blogs hanging, so one doesn't know if we have to ask each time we apply the same thing to other blogs. If you want to be safe, you may want to set the main page to display less posts in the main page, etc., or write to AdSense Support for clarifications. Acknowledgement: The idea of using <table> was obtained from Wrap text around Google AdSense but was modified and an alternative way was presented. Further, she used an image to display the HTML which means you can't copy the HTML direct from the site. I use special codes to display the HTML characters so that you can copy the HTML direct from this site to use for your hack. Any problems, please comment in the post. One reader has complained about confusing l (L) with 1 (one). This has been clarified with a note right at the top of the post. He also commented on some problems with the table tags. I have retested the method described here in Generating Revenue from your Website, and for the table tags, I just use copy-paste from the script in the scroll box above. The method worked perfectly, so there is NO PROBLEM with the table tags. Note that the photo is a hyperlink. Click on it and see where it takes you. This post is a follow-up from the earlier post Put photo of authors in post footer (click BACK button to get back to this page). If it is your profile you want to link to, then you will have to get the URL of your profile, and one of the ways to get it is if you have your profile (About Me) displayed in your blog, right-click on "VIEW MY COMPLETE PROFILE" and select "copy shortcut" (This is for Firefox. With other browsers, the wordings will be slightly different but similar) and substitute the first URL highlighted in red with this URL. If it is another site you want the photo to link to, and you are not very familiar with URL, refer to What is URL and how to get it. The other one you need to change is the photo URL. If you already have a photo for your profile, and you want that photo, go into Dashboard, at the top-right corner, click EDIT PROFILE, then look for "Photo URL" and copy the URL from the box on the right of it. 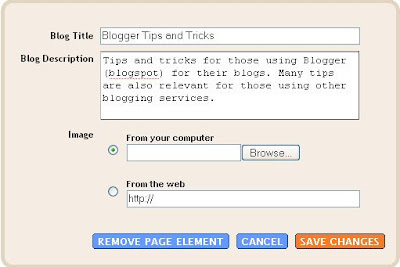 If it is some other photo you want, then refer to Using New Blogger to host your photos for the profile, sidebar, etc. If you want the photo at the bottom of EVERY post without having to paste the code each time you make a post, get into the Dashboard of your blog, click SETTINGS > FORMATTING and paste the code into the post template at the bottom of the page.